MILWAUKEE, November 3, 2017 – Amid geopolitical uncertainty, industrial company executives continue to anticipate increased growth in 2018, according to Global Industrial Survey results released today by Baird, an employee-owned global financial services firm. The survey, which polled industrial executives ahead of the 47th annual Baird Global Industrial Conference, was designed to identify what company executives believe are the key drivers and threats to profitable growth in the year ahead and highlight continual trends in the industry. Similar to last year’s Global Industrial Survey, company executives anticipate that increased M&A activity and cost efficiencies will continue to drive earnings growth next year, with 69 percent expecting flat capital expenditure and 67 percent anticipating cutting costs. Respondents again ranked a focus on bolt-on acquisitions as their top capital allocation priority over the next 12 months. The cyclical recovery that gained momentum in 2017 is expected to continue in 2018 with over 65 percent of respondents believing that growth in energy and mining markets will accelerate. In addition, aerospace and U.S. commercial construction are expected to continue to expand. While some key findings from this year’s survey are consistent with last year’s results, others show significant shifts. For example, last year weak commodity prices weighed on capital spending expectations. The level of commodity pricing is still important to managers; however, overall U.S. Economic growth is viewed as the most important macro-factor today. Additionally, there does appear to be some growing concern about government policy that could disrupt some of the positive trends management is seeing over the next 12 months. 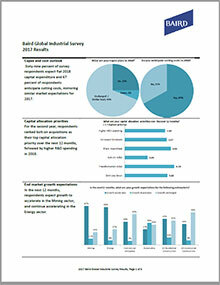 Another significant shift from last year’s survey results illustrate that the industrial markets are growing worldwide. Last year, the majority of executives anticipated that growth would be flat across the globe, however this year survey respondents indicated that they now expect that growth will accelerate in three major geographies in 2018, including China (56 percent), East Asia (52 percent) and North America (47 percent). 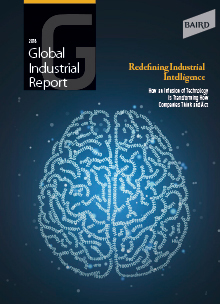 Longer term, respondents expect higher machine connectivity, commonly referred to as The Internet of Things, and Big Data, such as analytics, artificial intelligence, and virtual reality, to have the biggest impacts on the industrial market over the next three to five years, mirroring last year’s results. Baird conducted a survey of forty-eight industrial company executives in conjunction with the 2017 Baird Global Industrial Conference in Chicago, Illinois, November 7-9, 2017.